Do you love baking? Maybe you just like eating baked goods. Either way, imagine you were a baker and you needed to make cookies to fill your trays. It would be ridiculously time consuming to make enough dough for one cookie, bake that and then start on the next one. Slightly better would be to make a lot of cookie dough but still bake them one or two at a time. Better still would be to make a big batch of dough, fill a baking tray, and bake it all at the same time. This is the idea behind batching. Batching is a term that gets thrown out a lot in the business and entrepreneurial world. It is the idea of grouping similar tasks to be done all at once. This makes you more efficient as you get into the groove of repetitive tasks, or a similar type of thinking. Meal planning is a great example of batching that can be done at home. It's hard to come up with what to make for dinner each night. When you meal plan, you get all that hard thinking and decision making done at once. You get into a groove. You think i'll make burgers Monday and then use the left over beef for taco Tuesday. Your prior decisions help you make your next ones and its easier to come up with a week's worth of meals. Now during the week, you don't have to waste time thinking about what to make; wondering what everyone will want. The decision is already made. In relation to meal planning, you can also perform weekly meal prep. This is when you actually start preparing the food that you will make during the week. You can chop all the veggies and put them into containers, divide large packages of meat into the portions you will make each night, make lunches, and any other prep that can be done in advance. Having this done all at once, ahead of time, saves time and cleaning. You only have to take out the cutting board and knife once a week instead of daily. When you get home from work you can just jump into cooking instead of having to prep. That means a faster dinner and more quality time with family after a long day. Batching doesn't just apply to mealtime, you can use batching for any number of tasks. You can use batching to go through your weekly papers and mail. To learn more about that, check out my post on the Weekly Basket Organization Tactic. You can batch folding the laundry. Do a couple of loads and then sit on the couch, turn on Netflix, and fold them all at once. You can batch running errands. Pick out a route and just go from one to the next. Or pick a location where you can do the most at once. For example go to CVS for the prescription and the toothpaste that ran out. Then head next door to the gas station for the vehicle inspection and get 3 errands done in a snap. You can batch making phone calls. Call all the vendors and appointments you need to make all at once with your schedule in front of you. I hate making calls like that, so getting it all done at once is a huge weight off my shoulders. You can use batching for paying bills, cleaning, doing craft projects and more! 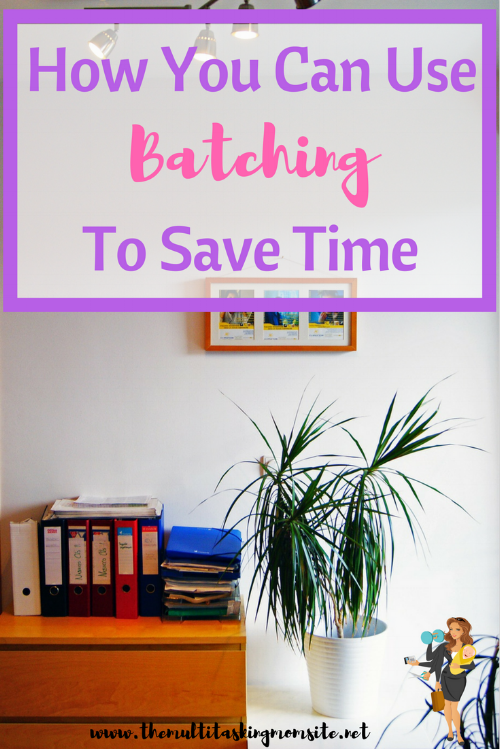 Batching is a great way to save time and energy throughout your week. Decision fatigue is real and doing the same task over and over again can allow to relax your brain a bit. You also save all the time it takes to switch between tasks and you are able to get into a rhythm. Batching is one of my favorite ways to save time. Do you have an idea of something you can use batching for? Share it in the comments!